Yamaha President Tom Sumner (second from left) joins Guitars for Vets Co-Founder Patrick Nettesheim (far right) and G4V graduate veterans on stage. “It's a small measure of appreciation, but it's richly deserved, and if it makes a veteran's life more bearable we'll gladly step up,” said Tom Sumner, president, Yamaha Corporation of America. Yamaha joined veteran’s group Guitars for Vets (G4V) this evening to hold a live music performance in Nashville to highlight National PTSD Awareness Day, as well as G4V’s program of rehabilitation from post-traumatic stress disorder through music. 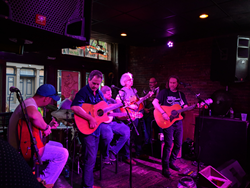 Students and graduates of the G4V program’s Nashville chapter made up the bulk of the performing musicians at this free event at Nashville’s Benchmark Bar & Grill, including chapter coordinator Brandon Branham. The ensemble was joined by guest guitarists Bobby Tomlinson, Isaac Matthews, and G4V ambassadors Sonny Moorman and Ali Handal, along with Yamaha Drum Artist Brian Fullen. G4V co-founder Patrick Nettesheim and Yamaha Corporation of America president Tom Sumner, both guitarists, also joined the group onstage. G4V provides veterans suffering from PTSD with lessons on the guitar and a forum to play as a means to heal and cope. Since its inception in 2007, G4V has grown to support 80 chapters in 40 states, operated by over 300 volunteers. Each student in the program is presented upon graduation with his/her own guitar pack, the crown jewel of which is a new Yamaha acoustic guitar. Graduates describe their guitars and the music they play as a way to ease their pain, give them focus, build their self-esteem and strengthen their sense of purpose. Yamaha has been supplying G4V with guitars since 2012 at dealer cost, making it practical for G4V to expand to its current scope. To date, through this cooperative effort, over 2,000 new guitars have been awarded to grateful veterans as they graduate from the PTSD rehabilitation program, along with an additional 100 guitars donated outright by Yamaha. National PTSD Awareness Day is observed annually on June 27 as a day to recognize the effects post-traumatic stress has on the lives of those affected by it, including roughly 800,000 veterans. Historically, those who serve in our military have been especially susceptible: roughly 20% of service members deployed in the past six years have developed PTSD, and since the Vietnam War, more servicemen and women have committed suicide than have actually died in battle.